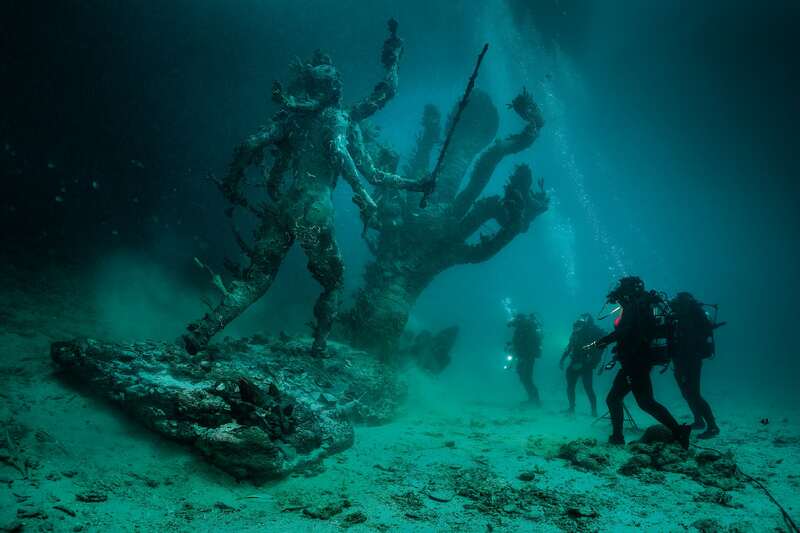 What is narrative in art, music, sculpture and architecture? It is the representation of an image, sound, shape or form which suggests a story. Narrative may be fictional or nonfictional. And it can be represented in all artistic styles from abstract through to highly realistic. 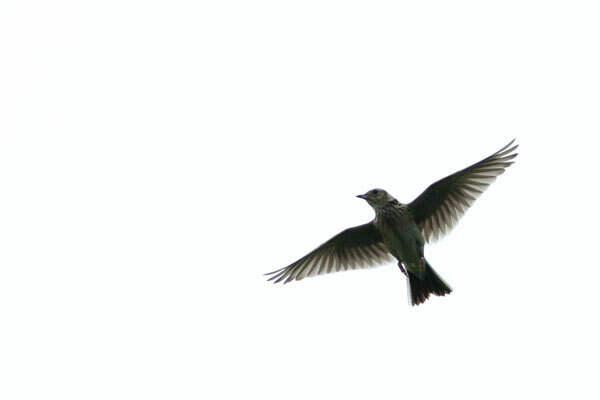 An example of narrative in music is ‘The Lark Ascending’ by Ralph Vaughn Williams. As the notes go higher and higher the imagination of the listener is able to picture a bird rising on thermal currents into the sky. I suspect that the music does not refer to any particular lark but rather to a fictional lark of the imagination. However if we listen to Steve Reich’s work ‘Different Trains’, he describes the narrative as documentary because it includes actual voice recordings of passengers. War artists, in this case Jules George, are entrusted with the task of recording actual scenes of battle. The narrative here is documentary, and the introduction of a fictional narrative would not be acceptable. 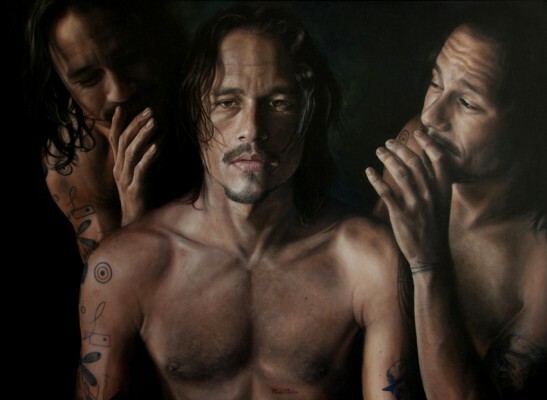 The portrait of Heath Ledger (2008) by Vincent Fantauzzo is a portrait and is therefore a nonfiction work. Interestingly he incorporates a fictional strategy of using two other viewpoints of Ledger to represent ‘voices’ which he hears in his head. This may be called ‘creative nonfiction’, which I will go into later. 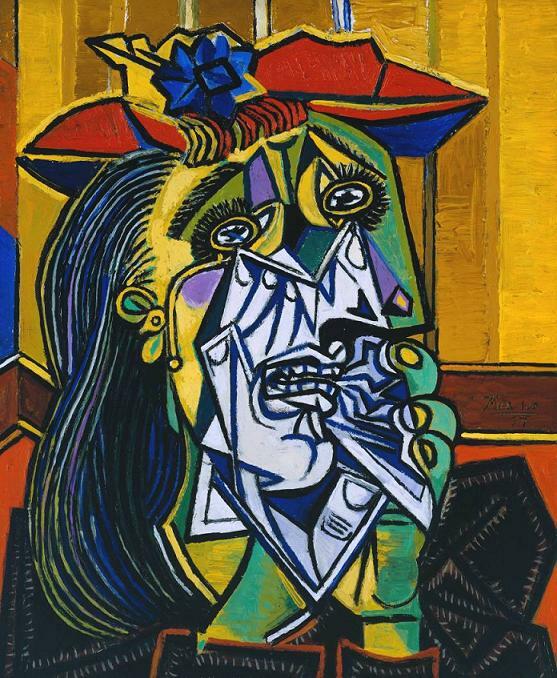 Next we will look at ‘The Weeping Woman’ by Picasso. We may not know why she is weeping but we feel sympathetic and are pulled into her story. 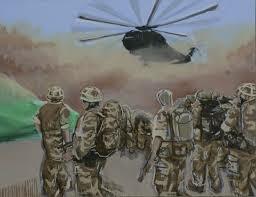 This painting is a response to an actual situation, and so may be classified as having a nonfiction narrative. 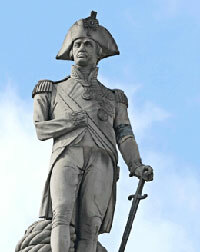 In sculpture there is a long tradition of representing nonfiction narrative, as in this lifelike representation of Admiral Lord Nelson. 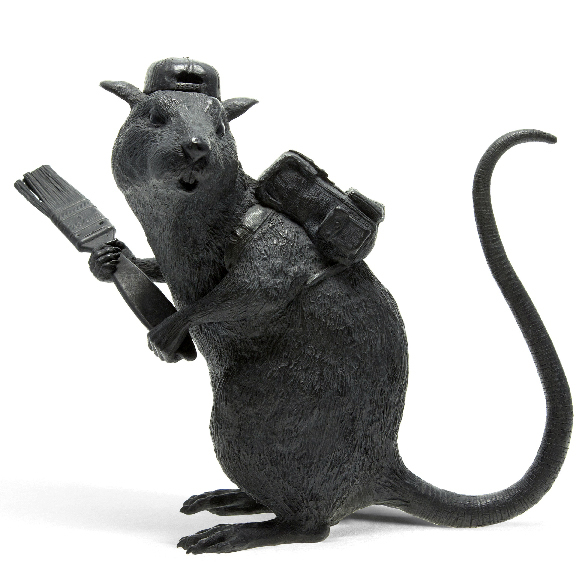 Sculpture can also contain a fictional narrative, such as this rat by British street artist Banksy. Notice that while all the components of this sculpture are nonfiction (the rat, the cap, the paint brush and the pack) they are brought together within a fictional narrative framework. 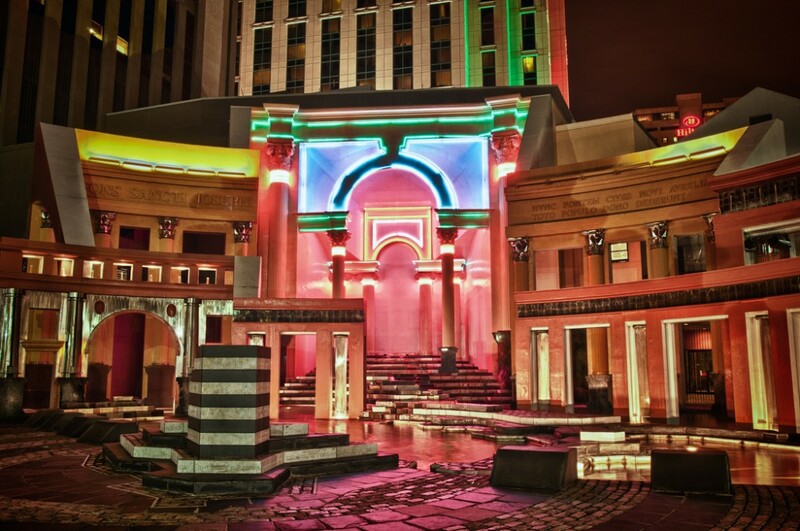 And in architecture we can find a good example of narrative in Charles Moore’s ‘Piazza d’Italia’, built in New Orleans in the mid nineteen seventies, where Roman arches and a map of Italy combine to tell a story about the Italian influence in the area’s cultural development. Narrative is not always a significant part of artistic expression, and even when it is present, it may be unacknowledged by the artist. In architecture most buildings show no clear expression of narrative. In the Piazza d’Italia however we see a rare example of architecture shaped by a narrative which is expressed in a highly literal way. While narrative in literature may be nonfiction or fiction, narrative in architecture is almost always nonfiction. 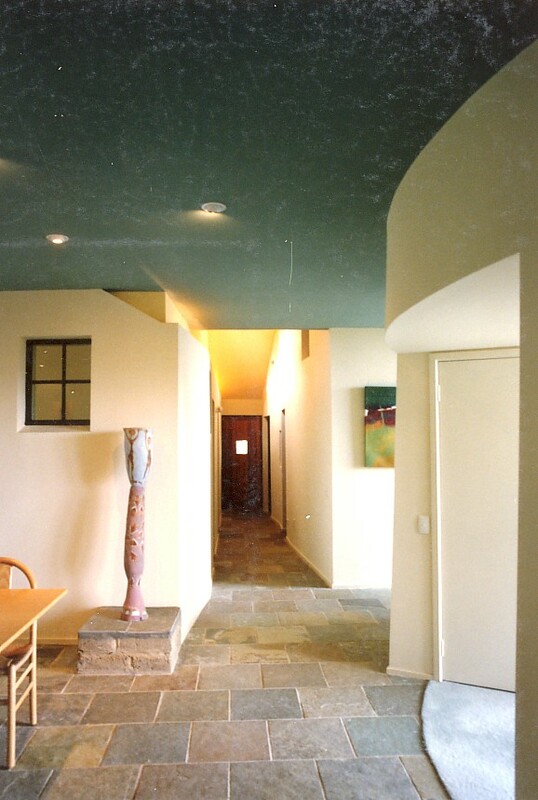 When starting to read a text in literature we are used to asking the question ‘Is this fiction, or is it factual?’ When entering a new building we just accept that this is the architect’s idea of how a building should be designed in order to be cost effective, ecologically sustainable, and watertight. Fiction does not enter into our thinking. The Melbourne building called Council House 2 is a good example of this. There is quite an overt narrative which is drawn from the function of the building. 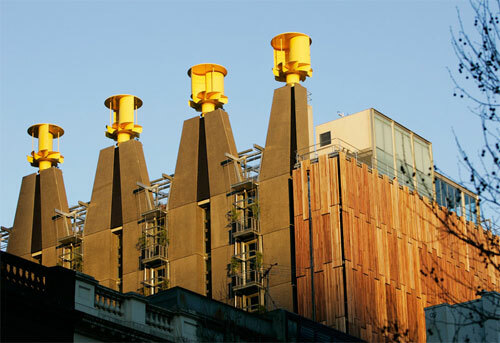 You can see how the various sustainable features have been expressed and made elegant, such as the vertical ventilation stacks. 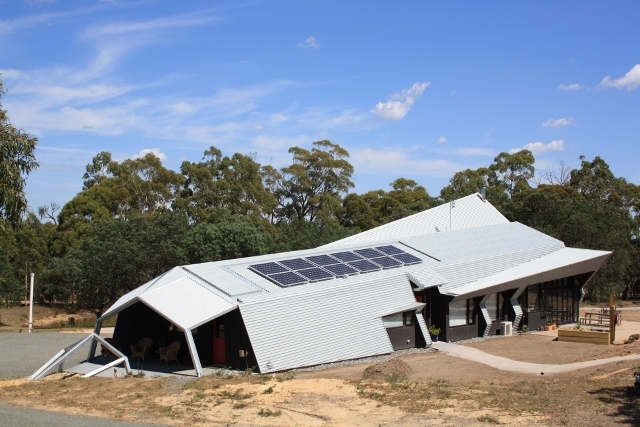 This building has a nonfiction narrative relating to sustainability which connects with a meta-narrative about global warming. While some narratives spring from function, others spring from the purpose of the building. Again choosing the Piazza d’Italia, this narrative was generated by the desire to create an identifiable place around which a number of speculative office buildings would be developed. 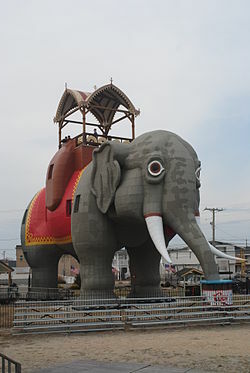 The Italian theme was chosen primarily from the point of view of creating an identity for a commercial proposition in much the same way that Lucy the Elephant was built to attract people to a real estate development at Margate in New Jersey in 1881. 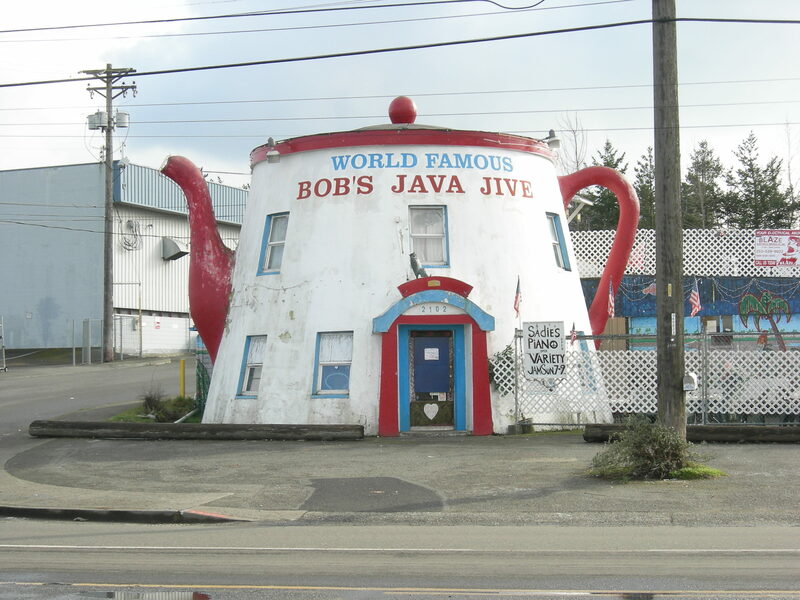 More common are buildings which have a visible form closely related to their purpose, such as the Tail o’ the Pup kiosk, or the coffee pot shape of Bob’s Java Jive. This type of building was most common in California in the 1920’s and 1930’s when there were literally hundreds built to attract attention from passing traffic. They have been lovingly documented in Jim Heimann’s book ‘California Crazy and Beyond’. 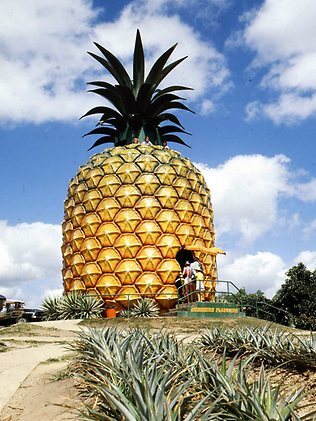 Australia has a number of such buildings, most famously the Big Pineapple. 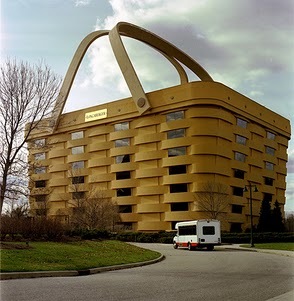 In recent times there have been a number of quite extravagant commercial buildings advertising their wares, as in the case of the headquarters of the Longaberger Basket company. Some, like Lucy the Elephant, have no apparent connection between form and purpose. 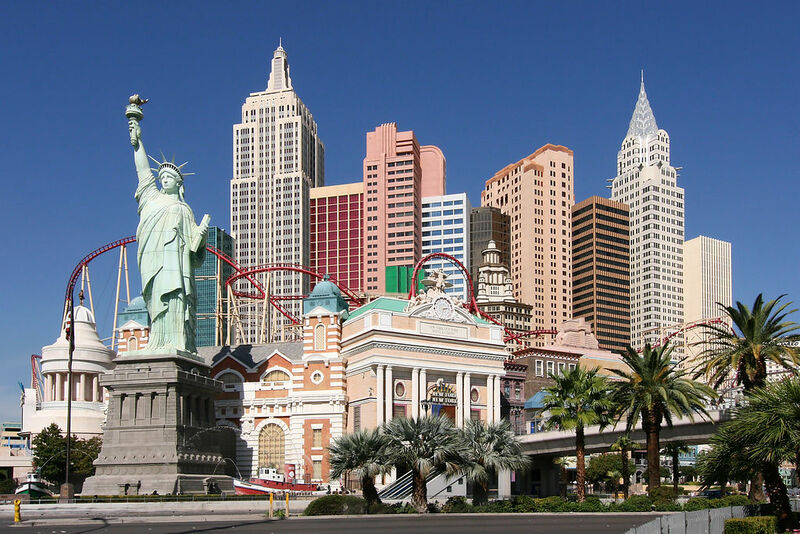 An example is the New York New York hotel and casino in Las Vegas, which replicates iconic New York buildings simply to create a spectacle. So far we have dealt with narratives generated by function and purpose, and now I would like to introduce a third category: context. 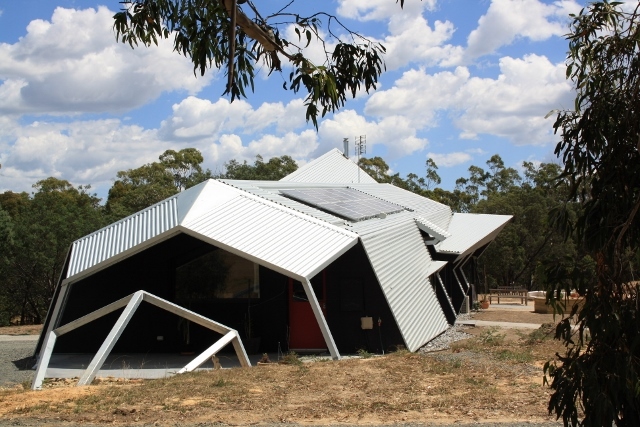 A building near mountains may be shaped to echo the mountains (architect Robyn Boyd in this case); a building near red brick buildings may be constructed also of red bricks; an infill house in a street of three storey terrace houses may respond to context by also being three stories high. 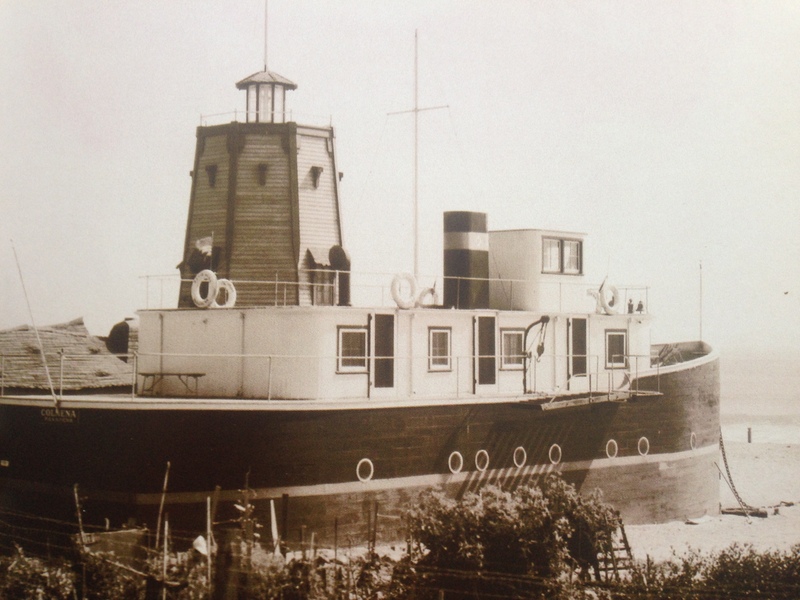 A Hollywood starlet who built her house on the beach in the shape of a ship and lighthouse has certainly adopted a narrative approach to context. 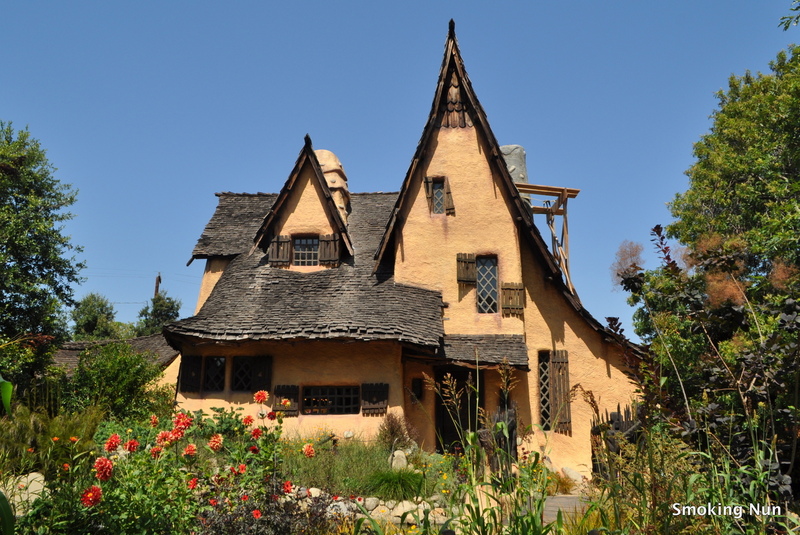 And this building designed in Hollywood to look like a house where a witch in the story of Hansel and Gretel might live is a good example of a narrative response to cultural context because of the nature of the film industry in the vicinity. 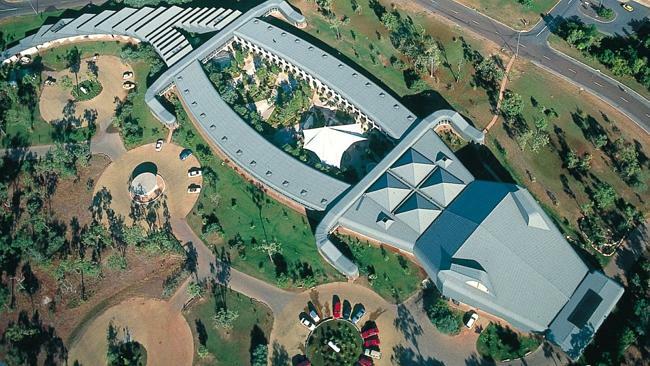 The Gagadju Crocodile Holiday Inn in Australia, which appears from the air to be a giant crocodile, is responding to the Aboriginal cultural and ecological context. A building with a narrative which responds to context is nonfiction because it ‘comments’ on the actual circumstances which surround it, illuminating the context in some way. It seems surprising that fictive ideas generated by the function, purpose or context of buildings can exist in buildings which have nonfiction ‘narrative frameworks’. However if we compare architecture with literature we can draw an analogy here with the work of Lee Gutkind and his concept of creative nonfiction writing. Even though a topic is nonfiction it can still be explored using all kinds of fictive proposals and re-enactments. For example the nonfiction genre of biography can contain a fair degree of fictive speculation and dot-joining. Another analogy is that of the advertising industry, which often uses fictional scenarios within the nonfiction framework of the advertisement. 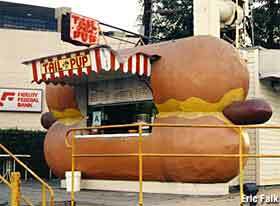 When we look at a hot dog shaped building selling hot dogs we are looking at the same thing: a fictional narrative (Let’s pretend this building is a hot dog!) subordinated to a nonfiction narrative framework (‘We sell hot dogs’). Everywhere we look we find that fictive narratives are subordinated to the main paradigm in architecture, which is nonfiction. And despite the fact that we architects enjoy these kinds of structures, which we label ‘programmatic buildings’, we tend to look down on them because they are a popular culture phenomenon, and retreat to the safe ground of ‘high architecture’. How can we escape this entrapment in the nonfiction paradigm? And how can we elevate the status of literally represented narrative ideas in architecture so that programmatic buildings of all kinds are given the respect they deserve? First it is necessary to accept the analysis set out in the arguments I have made: that virtually all current architecture is nonfiction even when it contains fictive narratives. Second, lessons must be drawn from the history of literature, specifically from the birth of the novel, which I am about to discuss. Third, there needs to be a paradigm shift to allow a new architectural category which, like the novel, is based on pretence, and in which fiction narratives have free rein according to the architects’ imaginings. 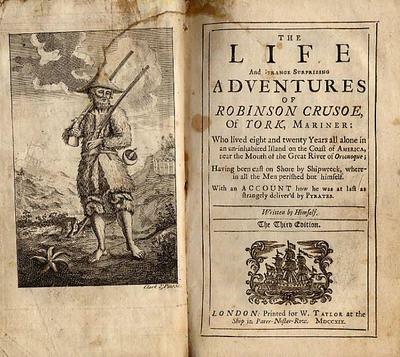 Prior to Daniel Defoe’s Robinson Crusoe and Moll Flanders, English language fiction prose comprised forms such as folk tales, the texts of plays, short stories, and translations of picaresque works such as the Decameron and Don Quixote. Initially the novel was a kind of hoax. Defoe’s novels were not published under his name, but purported to be ‘true accounts’ of his heroes. Naturally the readers understood that this was tongue-in-cheek: they knew they were dealing with pretence, not a documentary account. 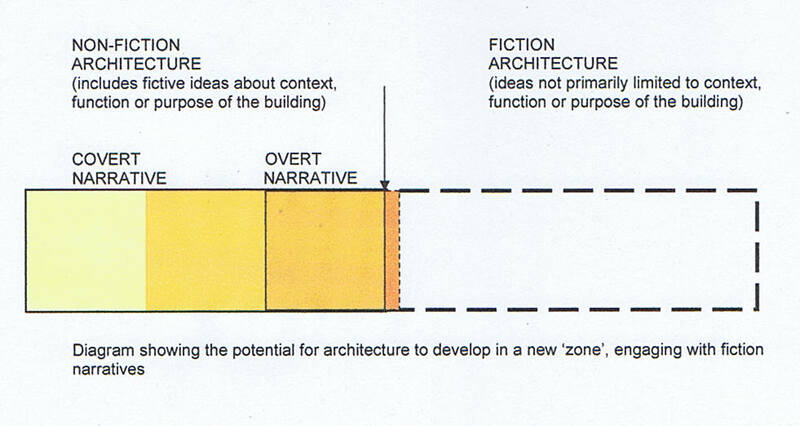 From this analogy, it is possible to propose the birth of a category in architecture which can be called ‘fiction architecture’ where make believe narratives can have free rein, freed from merely being responses to function, purpose or context. Like books, buildings can then be classified as fiction architecture or nonfiction architecture. Architecture is 300 years behind literature: it has a lot of catching up to do, in my opinion. What, then, does fiction architecture look like? And I am not talking about futuristic drawings or descriptions of buildings, which is architectural fiction. In ‘fiction architecture’ the ideas are expessed through the fabric of the building for the contemplation of occupants and visitors. 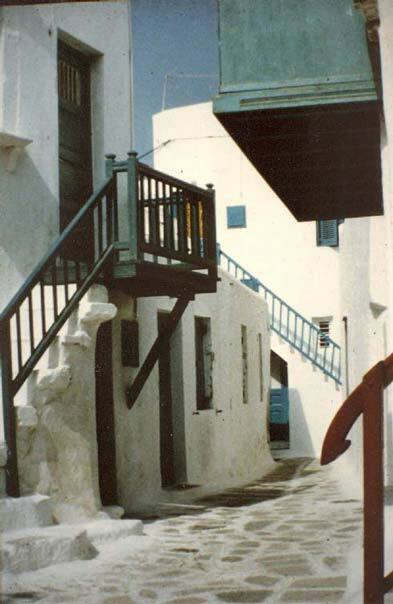 The first example I will show from my own work goes back to 1985 and is called the Greek Village House. 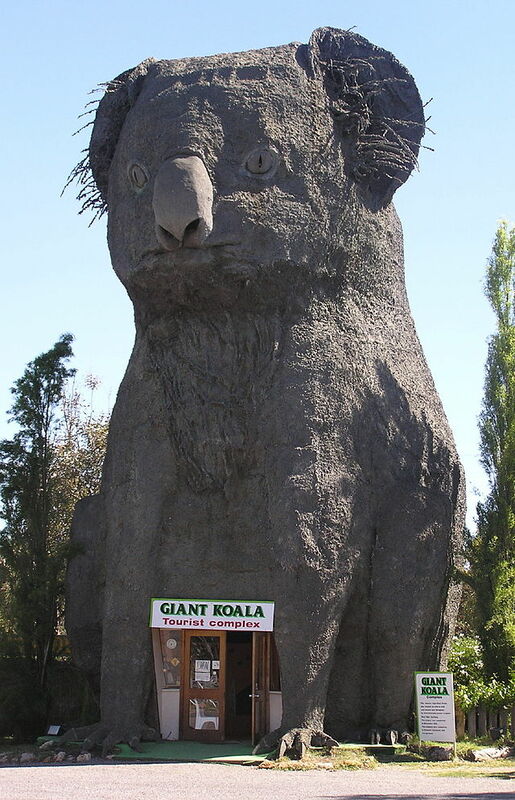 The owners had bought a block of land near Macedon, a small town about an hour’s drive north-west of Melbourne in Victoria. 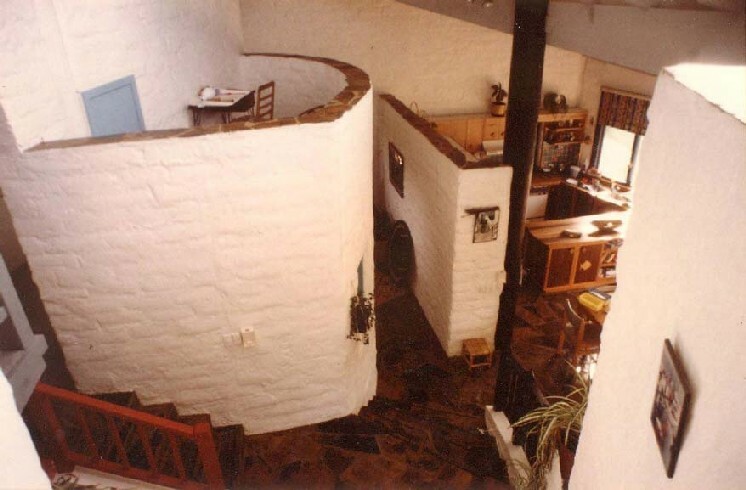 There were a number of stipulations from the owners including lots of winter sun and mud brick walls throughout. I was troubled at the time by the notion that international holiday travel was only one step away from colonialism because tourist invaders would cheerfully plunder photographs without compensation and carry them off to their home lands. As it happened the owners of the block of land had a wonderful collection of photographs of streets and houses on Greek islands which they had taken on a recent holiday. In what may be interpreted as a further act of plundering I was seized with the urge to recreate one of the photos as closely as possible, as the interior hall and stairway of the house. Working in plan, I recreated the street in the photo and adapted the houses to each become a room in the new house. The plan grew like the plan of a village might grow over time as each house is built. I set this plan under a large tent-like roof which radiated from the centre of the plan, enabling the parapet roofs in the original photo to be expressed. What results is a piece of fiction architecture on the theme of tourism. Like a novel it deals with ideas and issues but does not necessarily put forward any particular line of argument. The owners, their guest and visitors were left to contemplate their own opinions within a narrative of make believe. 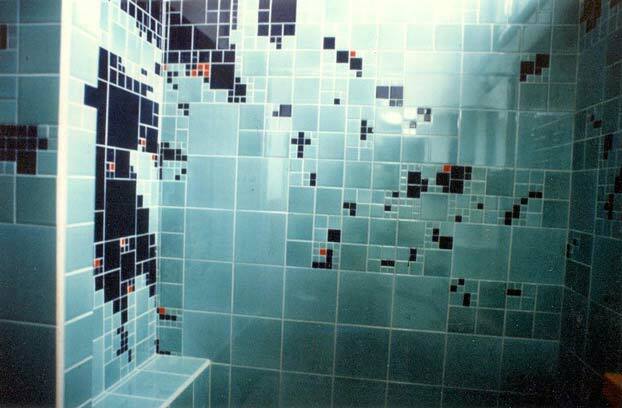 The shower recess even has a map of the Greek islands made of tiles. 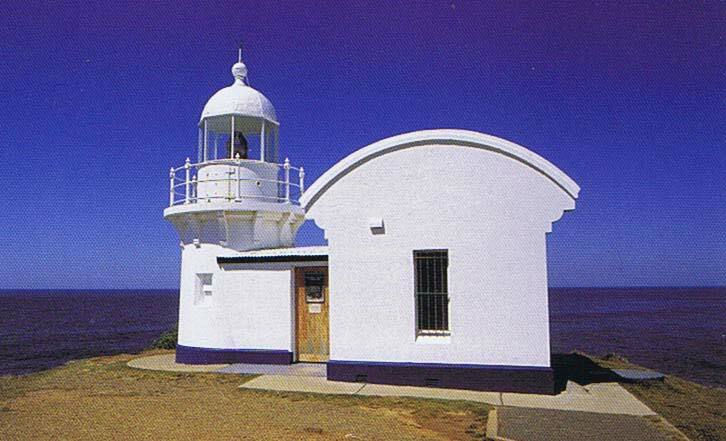 The second example is The Lighthouse. Not far from the Greek Village house rises Mt.Macedon and I was struck by the way it appeared like an island set in a sea of land. The site was badly located for winter sun and I wanted to use a giant periscope to pull sunshine down onto the land. A vague memory of reading an article by a feminist artist about nineteenth century objects in the landscape and how they were often innately phallic and implicitly patriarchal must have assisted at this point in helping me form the idea that the house could be a lighthouse in reverse, where light entered at the top and was reflected down into the rooms below. Reponse to context was important in all this but my idea transcended this consideration and took flight the moment that make believe entered the picture. Not content to represent a generic lighthouse I began a process of looking at books on lighthouses and chose one to copy. It was a very small lighthouse and I had to make it quite a bit bigger in order to fit rooms into it. 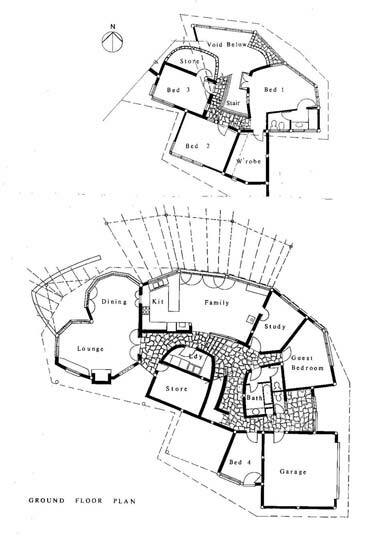 I drew a sketch plan to show the owners Bruce and Alison, and they accepted the concept. I was fortunate that Dr.Mirjana Lozanovska, who has completed a Ph.D study of the relationship between architecture and feminism, was working in our office at the time. She suggested that the Age of Enlightenment was a dark age for feminism. Rousseau’s views about the education of Emile differed greatly from his ideas about the upbringing of Sophie. The design explores phallocentricity from the time of Plato through to the current period of feminist critique. The notion of the centrality of patriarchy under the scrutiny of feminism is represented by the lighthouse form under the gaze of the cottage windows, where the cottage represents the site of female economic power, prior to the rise of industrialised manufacture. 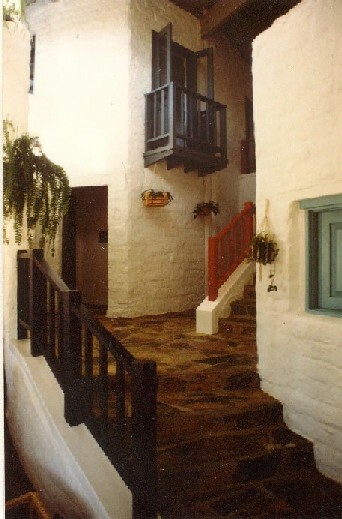 The place between the cottages and the lighthouse tower is a village green with a pump, a now defunct female public realm where women communicated and exercised collective power in the village. The lighthouse tower, where normally the light of male knowledge is ejaculated into the world, in this case functions in the opposite way to receive the sun’s rays and reflect them downwards into a ‘Plato’s Cave’ Living room where the fireplace and television are located. This could signify the possibility of an egalitarian concept of enlightenment, rather than one which is the preserve of ‘enlightened’ males who have climbed the stairway to the panorama above. The Lighthouse, appearing in the landscape as if it were an emblem of patriarchy, is actually a critique rather than an affirmation. 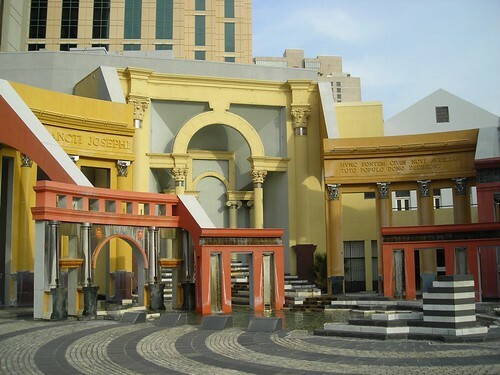 From all this it is clear that once a fictional starting point is adopted in architecture a great deal can unfold. 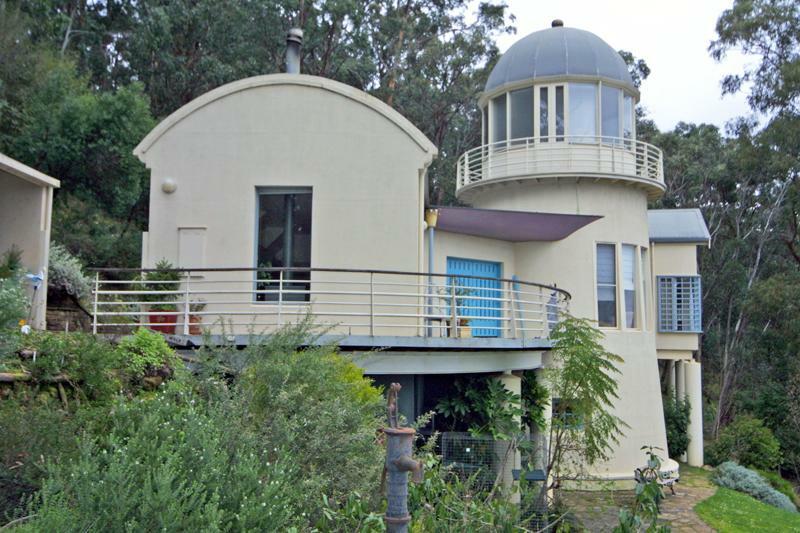 The Lighthouse at Mt.Macedon can be seen as a successor to the tugboat and lighthouse home in Los Angeles shown earlier, but with a narrative freed from merely reflecting context. The third example is The Gryphon. This house extension looms over an existing red brick Edwardian house in the Melbourne seaside suburb of Elwood. 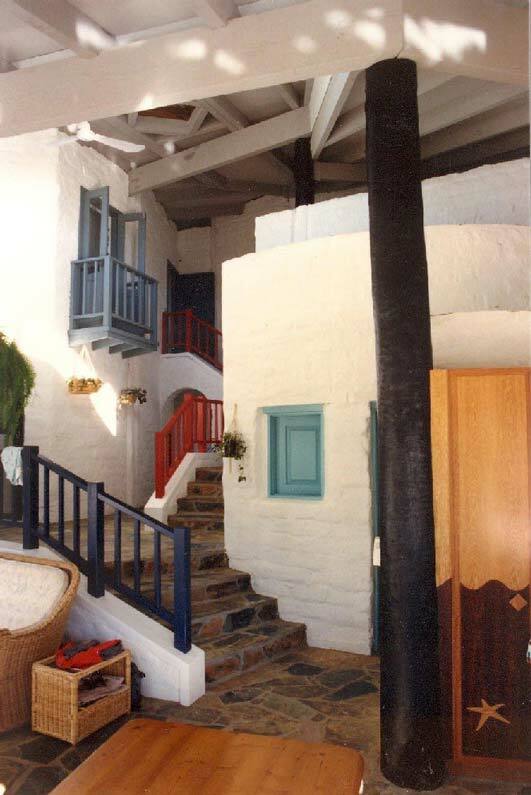 The owners Claire and Mark wanted something fanciful to make a lovely place for foster children and their only indication of the aesthetics was to say that they liked Antonio Gaudi’s work. My father became terminally ill in England and I travelled there to be with him and attend his funeral. I had a chance to visit the Casa Mila, the Casa Battlo and the Parc Guell, and found them to be deeply serious and beautiful. 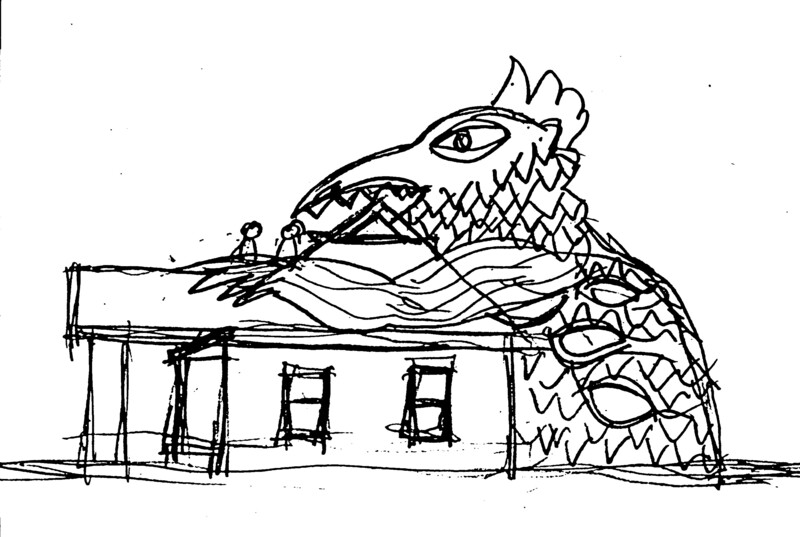 Some time after returning to Australia I awoke in the middle of the night and drew an image of a birds head towering over the house. I also drew a plan and elevation, then went back to sleep. Claire and Mark responded with excitement and this fictional narrative took flight, transforming itself into a mythical beast. 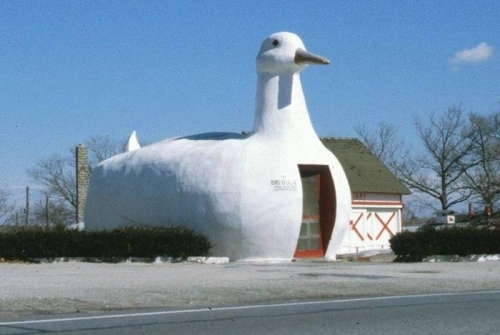 There are many precedents for buildings shaped like animals such as the Big Duck poultry shop in California. 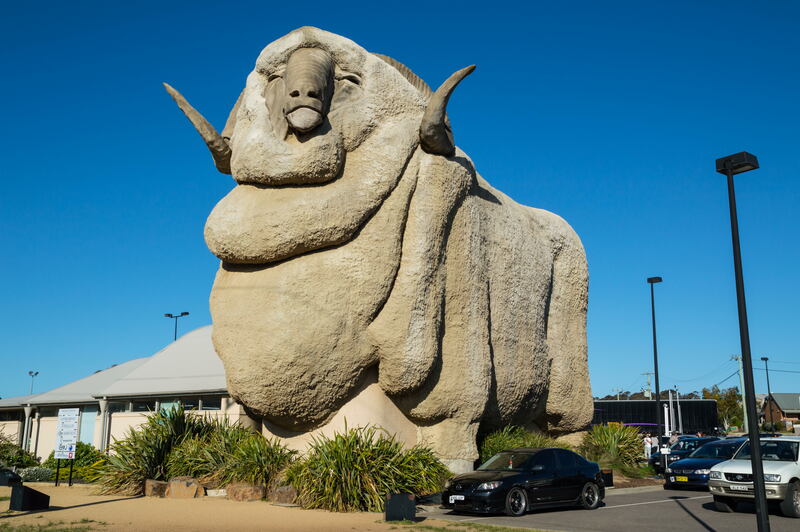 In Australia there is the Big Merino and the Giant Koala. While these precedents have narratives constrained by their commercial nonfiction purpose, the Gryphon narrative has free rein. 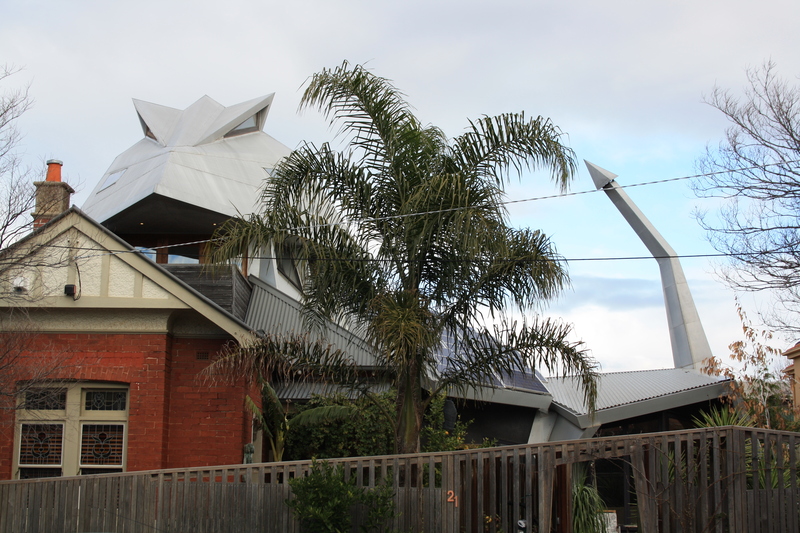 The fourth example of fiction architecture is a house extension in the Melbourne inner city suburb of Brunswick. The extension is on the side of an existing Edwardian weatherboard house. 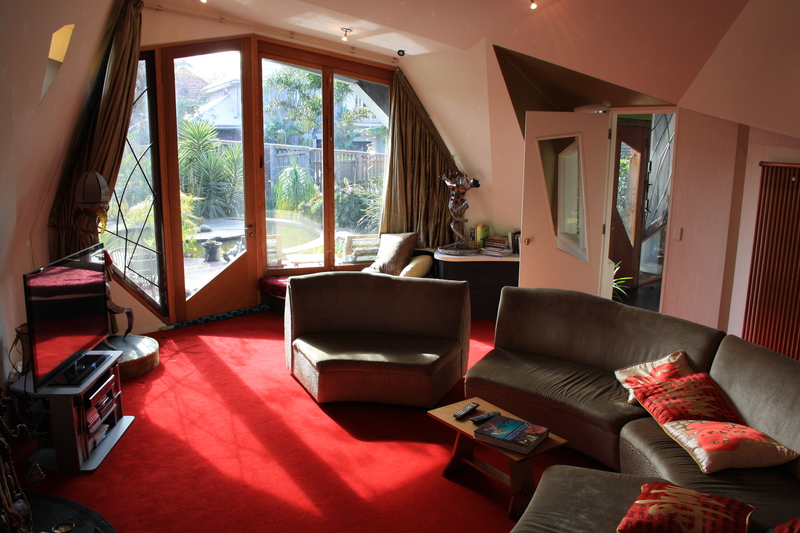 The owners Jen and Neil wanted a two storey building with bathroom and toilet downstairs and a studio upstairs. I was given no directions on aesthetics but I could not help noticing that these people had ‘attitude’. 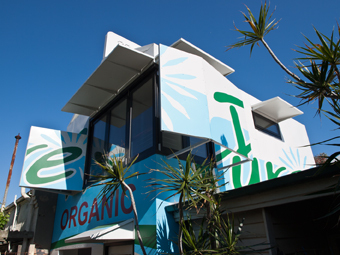 I wondered if this was the place to do something I had always wanted to do: build a house in the shape of a food package. The footprint sort of fitted, and the height was okay for a Tetra Pak as long as it was chopped a third the way up the carton. I made a model using a real milk carton, cutting out windows and folding up sunshades. Everything was immediately right, even the graphics on the carton, which mentioned such contentious words as ‘pure’, ‘unhomogenised’ and ‘low fat’. And because milk is white, there was no shortage of symbolism to be grappled with. I particularly liked the way this object came directly from our own kitchen table and seemed to say a lot about the puritanical times we live in. The Milk Carton can be compared to several commercial milk kiosks in the shape of milk bottles. 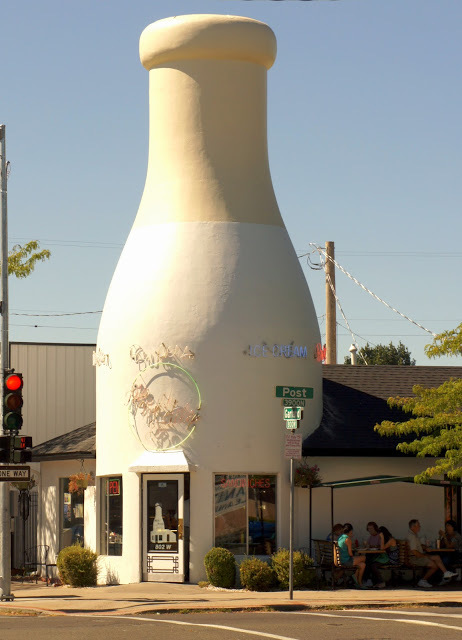 This example is the Benwah Milk Bottle building in Spokane, Washington. By contrast with the Milk Carton, this milk bottle is tied closely to the nonfiction narrative of an advertising strategy. 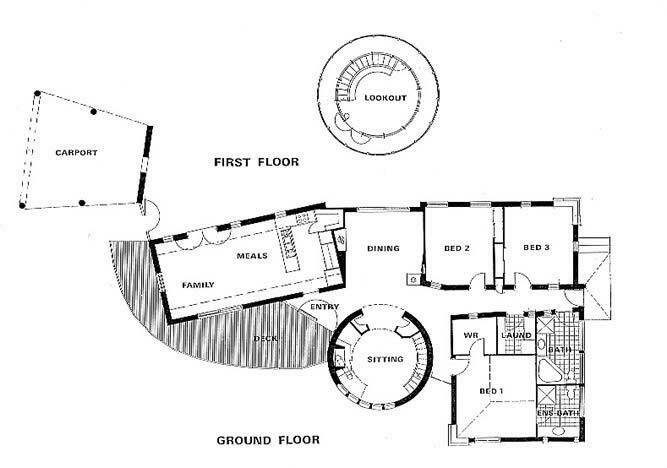 The fifth and final example is the Rocket House. 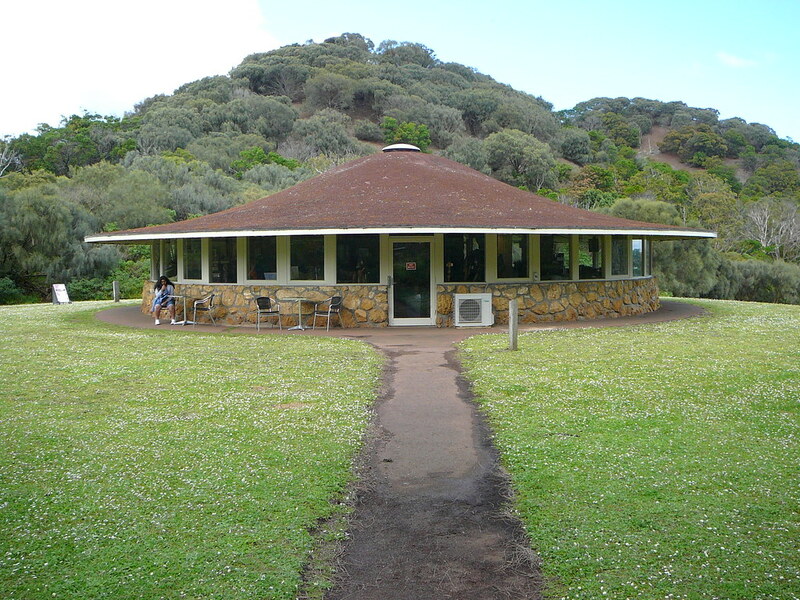 Designed for Bruce and Alison as a retirement home after they moved from the Lighthouse to a more gently sloping block further west at Woodend, it was an opportunity to follow another fictional narrative which I have been interested in for a long time. 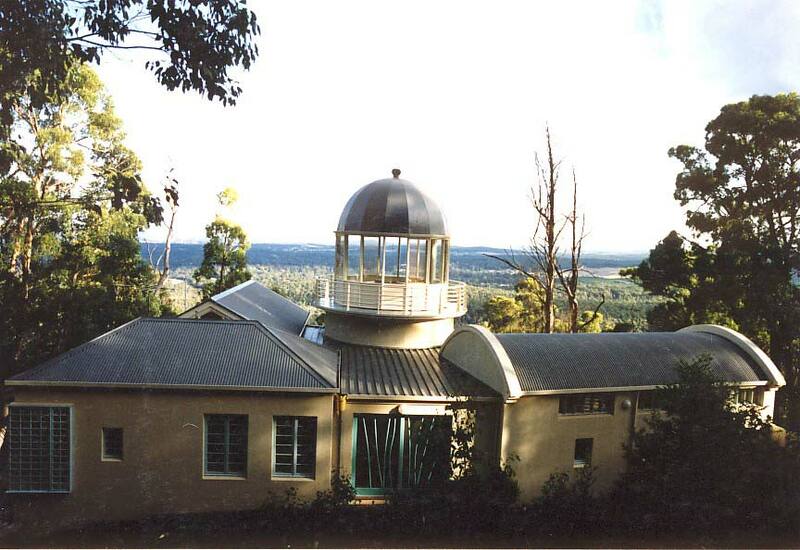 A spaceship or some other kind of large rocket appears to have crashed into the hillside and then has been occupied and converted to a dwelling. Visitors to the house have to ponder how it could have happened and what it signifies. I am happy for multiple interpretations to emerge. 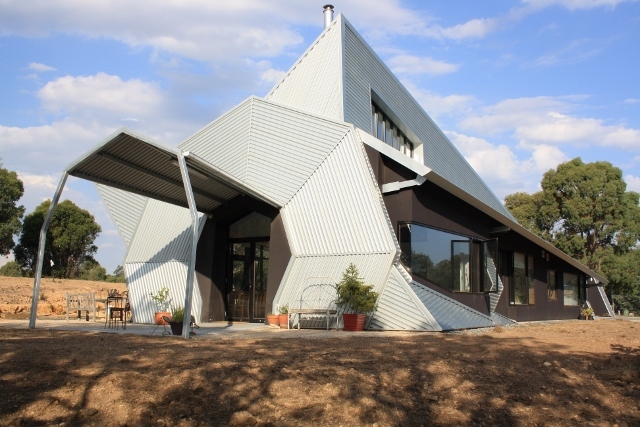 Perhaps the owners are aliens, or perhaps the survivors of a failed expedition to Mars. Personally I get satisfaction from the idea that the crashed rocket might represent the ‘coming down to earth’ of mid twentieth century ambitions to conquer the universe, and the realization that there are limits to growth and the use of resources. The five projects shown demonstrate that architecture incorporating fiction narratives can be achieved, beyond the constraints of function, purpose and context. Within a fictional narrative framework, ideas may be developed and expressed freely, as occurs in the form of the novel in literature. This paper was presented to the National Convention of the Popular Culture and American Culture Associations at New Orleans on April 3 2015. This is a slightly revised version dated 14th April 2015. Simon Thornton is a director of Simon and Freda Thornton P/L Architects in Alphington, Melbourne, Victoria 3078, Australia. Simon Sellars, the previous editor or AR, recently invited me to write an article for the magazine, which gave me an opportunity to summarise some of what I have written on this blog since 2009. 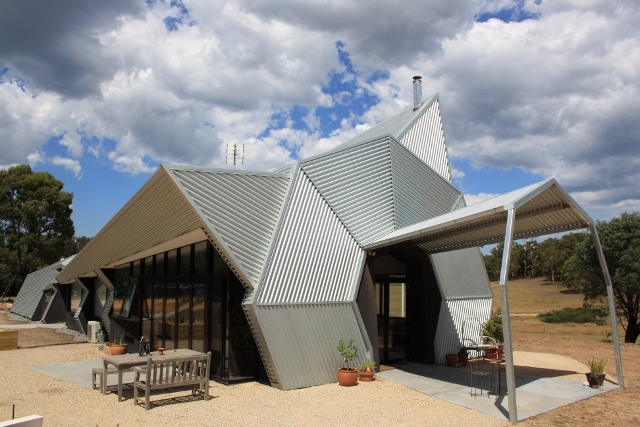 Subsequently Sara Lewis has published it on the website Australian Design Review. Before trawling through this blog, reading this article will give a good summary. The pendulum swing between libertarianism and puritanism recurs throughout history. During my lifetime I have seen the swinging sixties, the laid-back seventies and the indulgent eighties give way to a period of relative severity with regard to the ethics of environmental responsibility and social justice, along with a move towards restraint in eating and drinking, and the stigmatization of smoking. In sexuality the emphasis is now on responsibility rather than excess, and woe betide the adult who casts an interested eye towards someone wearing a school uniform. In art, this caution has extended to controversy over the photographic work of Bill Henson. 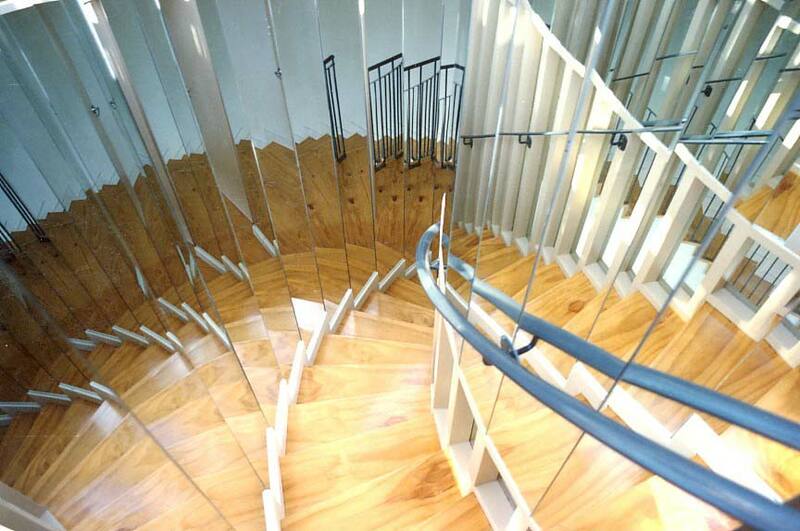 Architecture in particular is subject to a severe rationale. Footprints, carbon and building plan alike, should be small for the sake of the planet. 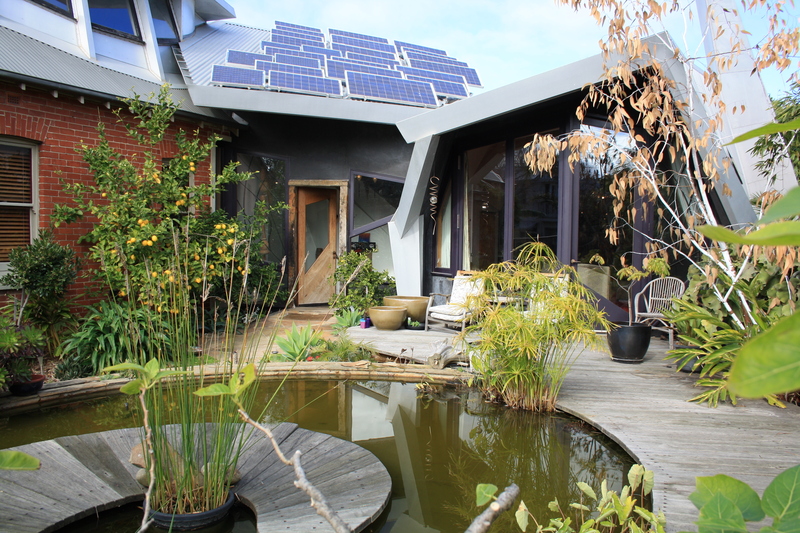 Eco-puritanism is now a style of design, involving rectilinear plans, constrained spaces, recycled timber and ‘natural’ colours chosen to harmonise with new-growth green. 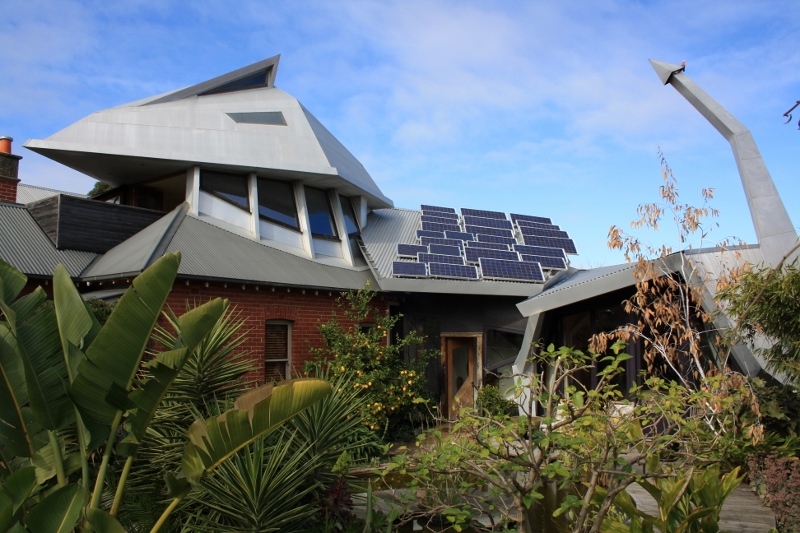 While I agree wholeheartedly with improving the sustainability of architecture, I think it is important to stop short of creating a style for ‘green’ architecture because it closes off analysis and new solutions. One way to avoid a repetitious approach is to search for a fictive departure point. Rather than embarking on yet another piece of documentary architecture dealing with the topic of sustainability, a fictional narrative grants a critical perspective. 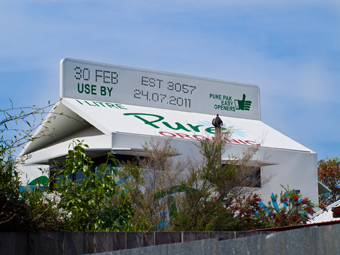 In the case of this project the site presented the opportunity for me to deal with a long-term preoccupation with shaping buildings in the form of used food packages. The new energy that brought this proposal to life at this time was a link with art history. The tradition of still-life painting embraces the notion that art should reflect the actual surroundings and normal artifacts found in everyday life. For the Dutch painters of the sixteenth century this meant cutlery, fruit, vegetables, fabric and dead birds. For Andy Warhol it meant the cans of Campbell’s Soup that provided easy-to-prepare ‘nutritious’ food, readily available from a supermarket nearby. Shifting forward fifty years, to another continent, the staple product that stands out on our suburban kitchen table is Pure Unhomogenised Organic Low-Fat milk. Furthermore, the notion of ‘still life found object’ is applied to architecture in this case rather than to art practice, in a move where the architect and viewer adopt the premise, widely expected in painting, that the narrative within the work is fictional. 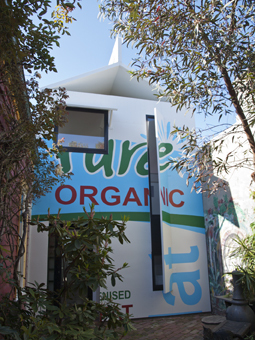 The Milk Carton can be described as fiction architecture because visitors take part in the pretence that they are entering a giant Tetra-Pak. This allows them an overview of the wider philosophical landscape within which our current set of assumptions about architecture lies. 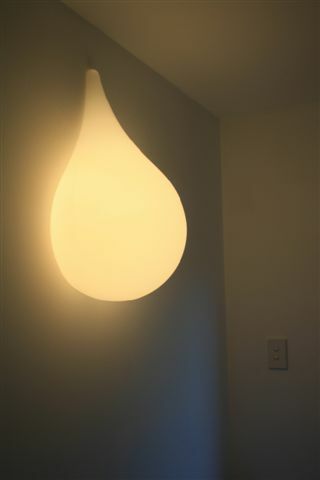 The spaces are small and mainly white, enlightened with milk drop-shaped light fittings. 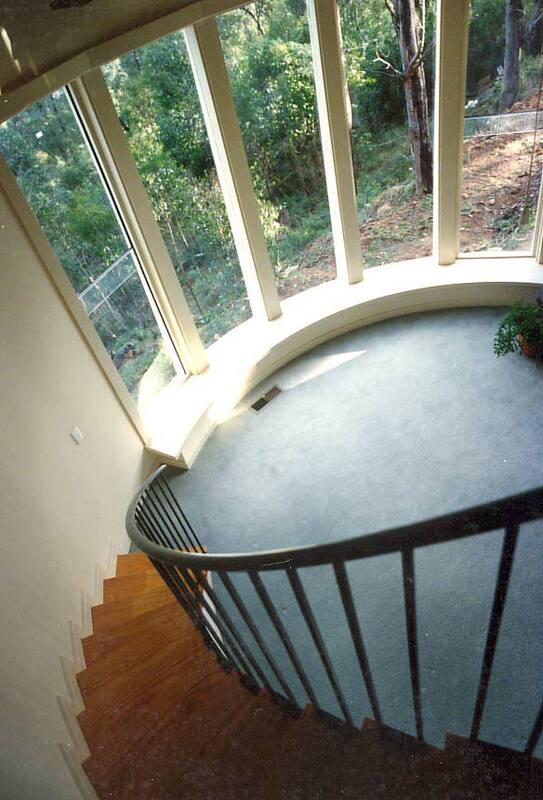 The stair is hardly wide enough to allow access. Light abounds and the footprint is small. The graphics on the carton refer to ‘good’ qualities such as ‘pure’, ‘organic’, ‘low-fat’ and ‘unhomogenised’. Milk is the primary source of nourishment for the newborn and hence has connotations of goodness, naturalness and nutrition. The theme of ‘milk’ also allows us to contemplate whiteness, and therefore consistency and untaintedness, and other associations that this colour has. Whiteness implies its opposite, blackness, which of course has its own set of connotations. The two together allow the possibility of oppositional thinking and, when taken to an extreme, puritanism. When puritanical attitudes are challenged, history shows that fanaticism may arise, particularly when fuelled by a desire for the acquisition of property, money or political advancement. It is well-known that witches were drowned or burned, but it is not often mentioned that their estates – in many cases of considerable value – were also confiscated. The word ‘unhomogenised’ is replete with nuances. The implications of the phrase go beyond the dairy farm to our culture in general. We used to believe in assimilation of migrants and the elimination of aboriginality, moving in the direction of homogeneity. This is now considered a very bad attitude, and so the word ‘unhomogenised’ engenders a generalized feeling of well-being, as well as the more specific attribute of reducing the degree to which fats in the milk contribute to fatty tissue in the body. 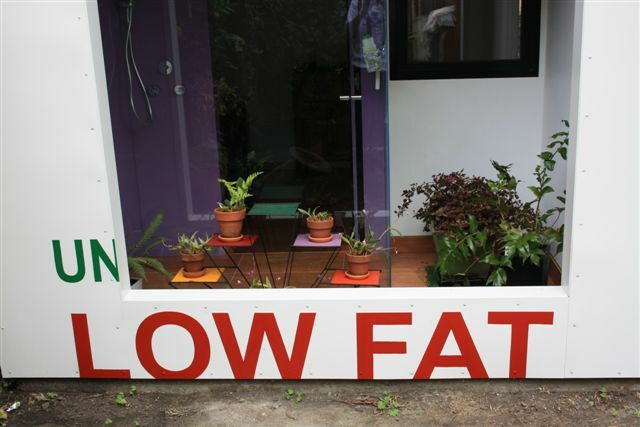 This brings us to the phrase ‘low fat’. Perhaps the most disturbing prejudice of our food-obsessed culture is the notion that fat is bad, and therefore fat people are bad. Fat people are immoral! They have clogged arteries and heart disease. The thinner you are, the fitter you are, and the fitter you are, the better you are. Thin people are morally pure. ‘Pure’ is the name of the product itself. Rather than calling it ‘milk’, which is associated with its high-floating cousin ‘cream’, and therefore early death and extreme obesity, the product has assumed a more abstract quality. You can’t argue with ‘pure’. It is free of pollutants such as pesticides. In terms of morality, it is free from sin. 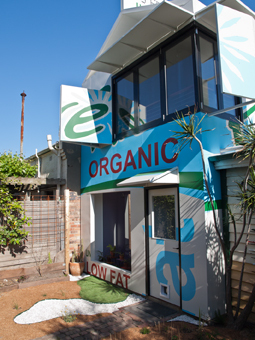 In farming terms, it is ‘organic’. Out of manure emerges pure white ambrosia. These thoughts are just a sample of the themes that may be contemplated by a person who takes part in the pretence that they are dealing with a gargantuan beverage container. I hope that enjoyment will flow abundantly. 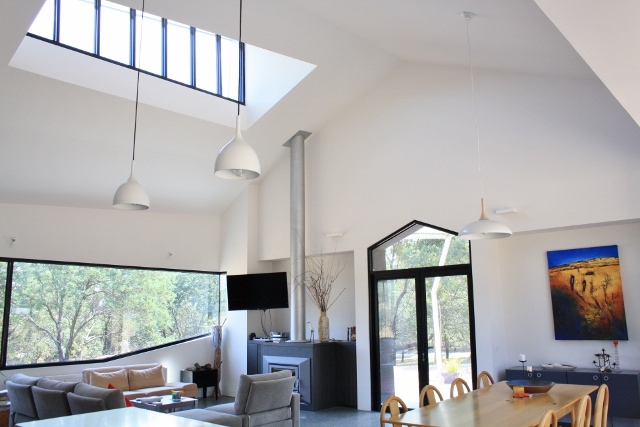 Footnote: In the accompanying photographs the large upper floor windows face the northern winter sun and the rear yard. The vertical screens are to protect the privacy of the neighbouring back yards. The extension is to the east side of the house and the south façade, shown in the first photograph, faces the street. 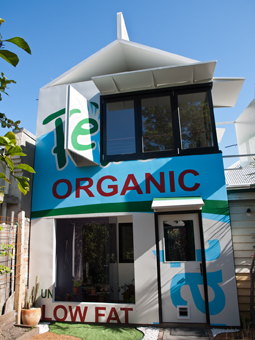 Credits: The Milk Carton house extension would not have been possible without the owners Jen Carmichael and Neil Davis, Craig Jones the builder, all the subbies and the sign writing team. Special credit to Neil for his meticulous work modifying and adapting the graphic design. Spilt milk landscaping designed and executed by Jen and Neil. Photos by Neil. Thanks also to Clara Friedhoff, my trusty assistant. In trying to establish a paradigm for architecture which acknowledges the validity of fiction narratives, I have recognised that we are used to the idea that narratives in art and sculpture are usually fictional, and I think that there may even be a general assumption that they are always fictional. However portraits and realistic landscape painting, and sculptures of politicians and historic leaders, are examples of non-fiction narratives in art. But it is not only in conservative approaches that we find narratives justified by purpose. A good contemporary example of a non-fiction, or documentary, narrative in contemporary sculpture is Two Digital Tigers, by LAVA (Laboratory for Visionary Architecture) and Jennifer Kwok. 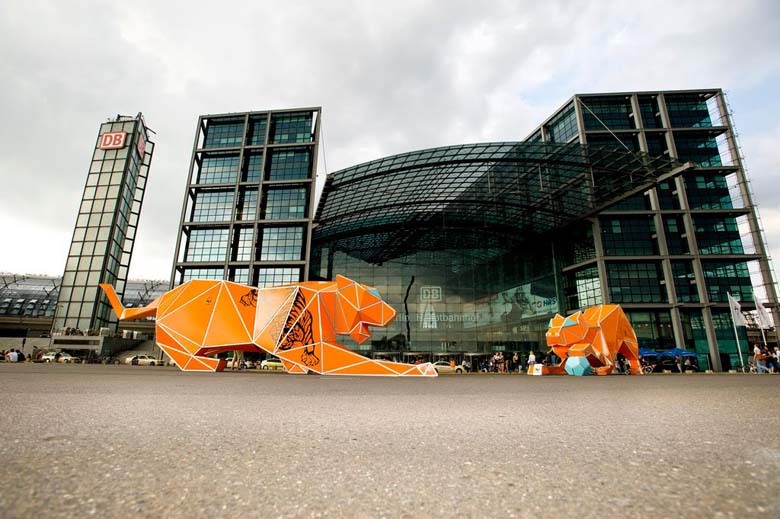 This beautiful work, utilising lantern-making techniques and lit with LED’s was created to mark the start of the lunar Year of the Tiger, and to draw attention to the fact that tigers are an endangered species. The World Wildlife fund has taken this work to Asia and the United States to raise awareness of the issue. Architects are used to non-fiction narratives: perhaps that is why this venture into sculpture by LAVA took a documentary approach.